VP9 vs H.265 HEVC - Which is the Future of 4K World? With UHDTVs becoming popular, it needs encoding mechanisms to compress 4K content for the UHDTVs. That's where HEVC (H.265) and VP9 have people take notice. Both HEVC H265 and VP9 provide 50% bitrate improvements over x264, and Netflix said that about 20% more efficiency can be observed in HEVC H265 over VP9 at 360p, 720p, and 1080p resolutions. Is that true? This VP9 vs H265 HEVC comparison will tell you which will be the winner on quality, efficiency, and compatibility. H.265 codec, or High Efficiency Video Coding (HEVC), a royalty-encumbered standard successor to H.264, provides twice the compression efficiency of H.264/AVC. With its huge gains in compression efficiency, HEVC/H265 will offer the same quality at less bandwidth (or half the bit rate/file size) or significantly better visual quality when the internet is bad. The codec is mainly used by Amazon and Netflix to deliver 4K movies and content to Ultra HD smart TVs and OTT boxes. VP9 codec is an open-source codec from Google, and thus is widely used on YouTube, Google Play as well as Google browser, the Firefox and Opera. Like HEVC h265 codec, VP9 also promises twice the coding efficiency of AVC or VP8, and four times that of MPEG-2. One of the biggest advantages of the VP9 codec over H265 HEVC is that it is royalty-free, while H.265 still charges patent royalties to its customers. Make VP9 and H265 HEVC playable for latest iPhone, iPad, Android mobiles. What's the Difference between VP9 and H265 HEVC? Apparently, both HEVC and VP9 serve the same purpose of compressing data-intensive HD and 4K videos to half the size as required now, so as to survive the limits of internet requirements, and make it possible to stream UHD videos to users' UHDTVs at less bandwidth without affecting the visual quality. But yes, if bringing up VP9 vs H.265 HEVC comparison, there are differences on compression effectiveness, picture quality and other factors. Higher compression efficiency means that less data a codec uses to display an image without quality loss. Both codecs are designed to compress 4K UHD videos to smaller size. But which will save you more data when you download or stream 720p and 1080p content? VP9 or H265/HEVC? There are many experiments conducted between HEVC H265 and VP9, and the results indicate that HEVC H265 provides from 0.6% to 38.2% bitrate savings over VP9 depending on the objective metric which is used. Netflix's tests also clearly showed that HEVC H265 is 20% more efficient than VP9. Video quality is an important factor to consider, which gives the better quality? Massive tests have shown that HEVC H265 offers superior quality to VP9, but how exactly? H265 can grab 64x64, 32x32, or even 16x16 superblocks for low resolutions, while VP9 is fixed to 64x64. In other words, videos encoded with H265 HEVC have a better visual quality on low bitrates than VP9. 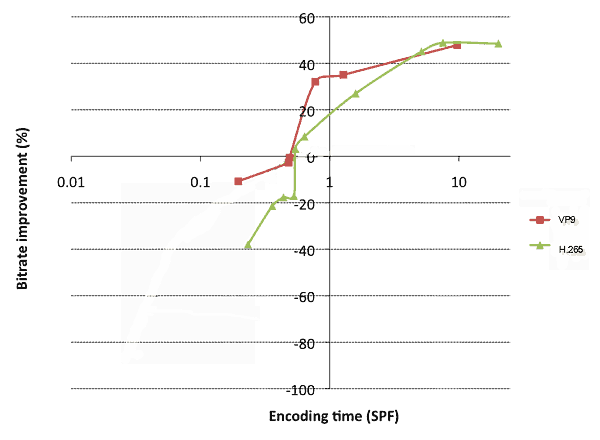 While for higher bitrates, VP9 can be better than HEVC H265. Below is a figure that uses SSIM to show you the quality comparison between H265 and VP9. You can see that the gap between the red and green lines gets larger as the bitrate goes down, and smaller when it goes up. 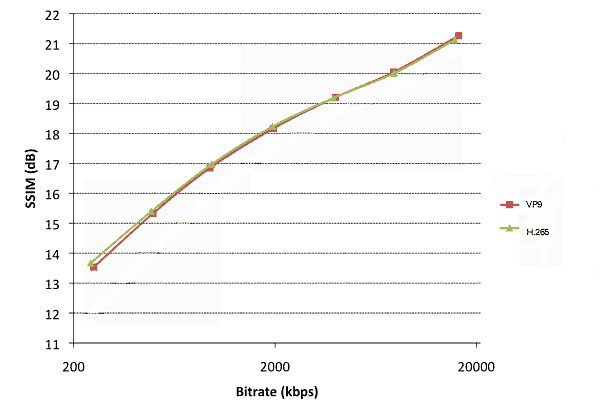 Small differences can be observed: at low bitrates, H265 slightly outperforms VP9, and vice versa when the bitrates are high. CPU usage means how much processing power the codec needs to playback. The UHD codecs will requires more power than their predecessors. For example, when you play, stream or download HEVC H265 movies to mobiles, your devices is more likely to gets stuck or overheat than H.264. About the CPU usage of H265 and VP9, there are already tests conducted using different resolutions. The results are listed in the table below, from where we can see that VP9 does better than H265 HEVC in CPU usage. Overall, if your computer runs slow, you may keep using H264, as compared with H264, H265 won't give any better results on the same CPU usage. As for VP9, you may expect a slightly better performance. When it comes to the compatibility difference between VP9 and H265, the story varies based on the platform you play. Apparently, VP9 has better compatibility with web browsers than H265 HEVC, with support on Google Chrome, Opera, and Mozilla Firefox, being the most widely used codec for web based HD video streaming. Plus, there is a huge list of big names like Samsung, LG, Intel, Sony, Sharp, Toshiba, and Philips get support for the codec. On the side of HEVC H.265, almost all the 4K TVs, VOD media players and major provider of streaming contents adopt it. Plus, Apple also adds HEVC support in the iOS 11 to allow users to play HEVC h265 on iPhone iPad. Considering the predecessor H.264's massive adoption, there is a huge possibility that H.265 will be the most commonly used standard for recording devices. Apparently, both codecs will need a VP9 or H265 video converter for more extensive playback. Bandwidth and file size decide the playback experience of the streaming videos. 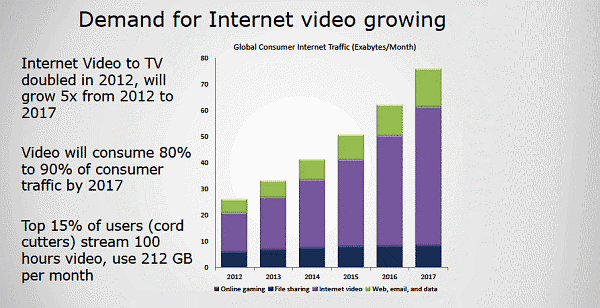 From the figure below we can see that streaming video is becoming an extremely important part of people's life. Will the streaming video playback be fast and smooth without any noticeable reduction in video quality? As mentioned in the compression efficiency comparison between VP9 and H.265 HEVC section, H265 saves more bitrates, namely, smaller file size will be resulted than VP9. Plus, Netflix has proved that H.265 is superior to VP9 with an average 20% bandwidth savings over VP9. That means compared with VP9, H265 HEVC requires less bandwidth and has less buffering when you stream, download or upload HEVC H.265 files. Even when Netflix has tested that H265 is 20% more efficient than VP9, it's still less adopted. One of the main reasons is the licensing fees charged to HEVC users. VP9 is open and royalty free while H265 is not. With HEVC Advance's fees targeting 0.5% of content owners, many largest tech companies have to seek for H265 alternatives like AV1 or VP9. While there are many devices supporting both 4K codecs, some other don't. There is hardware from TVs to mobile devices and set-top boxes that has trouble to play VP9 and H265. For example, there are services like Netflix, only support H265 HEVC, and others support VP9 only. If you want to convert both codecs, Handbrake or DivX Video Converter will help. If you want to convert 4K codecs with the fastest speed and no quality loss, then MacX Video Converter Pro is your best bet. 370+ video/audio codecs: Freely decode/encode among video codecs, e.g. convert HEVC h.265 to MP4 convert VP9, VP8, MKV, H264, AVCHD, MTS, etc. 400+ preset profiles: Convert H.265 or VP9 for mobiles iPhone X/8, iPhone 7/6S/SE, iPad, Android, webs, video editing tools without further tweaking. 4K video download: Superfast speed to free download SD, HD, VR, 3D and 4K hevc/vp9 from YouTube, Facebook, Vimeo, and 300 more sites. No.1 fast speed: The unique support of Intel QSV makes it the world's fastest HEVC H265/VP9 video transcoder, up to 3-5x faster than otheres. Advanced editing: A bounch of editing features to add subtitles and watermark, trim/crop/erge video, record VP9 and H265 video, etc. Step 1. Click "Add Files" to import the video. 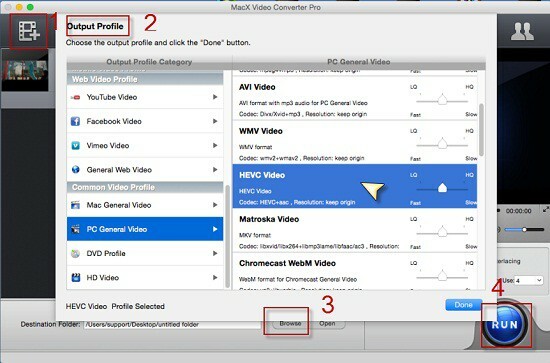 Batch convert is supported so that you can import multiple videos. Step 2. Find the codec or format you need from the column. Here are also ready presets for latest mobile devices. Step 3. Hit "Browse" button to specify destination folder. Step 4. Press "RUN" to start to convert H.265 or VP9 videos. If you want to convert the 4K codecs faster, check the hardware encoder box. MacX Video Converter Pro can easily convert HEVC H.265 or VP9 from/to H.264, AVI, QuickTime MOV, FLV, MP4, H264, 3GP, YouTube, FaceBook, iPhone, iPad, Android etc, and also free download 4K videos from 300 more video sites fast with high quality.